Lewis Moody was a firebrand openside flanker, a ball of energy often seen flying into the base of rucks or putting his body on the line for a charge down. Beginning his career with Leicester Tigers in 1996 at just 18, Moody competed for space in a back row that at the time housed both Neil Back and Martin Corry. Perseverance was key, and he was rewarded with appearances for the England Colts in 1997 and was a member of the side that took top prize at that season's Madrid Sevens. His full debut for England came in 2001 against Canada, while Richard Hill and Neil Back were in Australia with the British Lions. 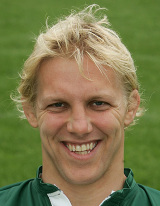 Having played in both tests, Moody would then win a Heineken Cup with Leicester in 2002 and establish himself firmly in the plans of both club and country. He was selected for the 2003 Rugby World Cup under Clive Woodward, and played a part in every match. Following starts against South Africa and Wales, it was from the substitute's bench that he would have his greatest impact, winning the lineout that fed Jonny Wilkinson's winning drop goal in the final against Australia. Moody's appeal for fans and coaches alike is his all or nothing style. A more committed player won't be found in the England dressing room, but in truth this attitude to the game has landed him in trouble on several occasions. In 2005 Moody suffered the ignominy of being the first England player ever to be sent off at Twickenham for fighting with fellow Leicester team-mate Alex Tuilagi. His penchant for playing the game on the edge has also at times put his teams into difficulty through the number of penalties that he is prone to conceding. His game is reliant on risk taking however, and to remove that aspect from his game would certainly neuter his impact from the base of the scrum. Moody was a tourist with the Lions in 2005, playing in two tests of the doomed tour to New Zealand. He emerged from the tour with some credibility in tact, being one of the few Lions players to cross the whitewash against the All Blacks and never giving up the ghost while around him the tour turned into a PR nightmare. Afer missing the 2007 Six Nations Championship through injury, he was selected as part of the England squad for the 2007 Rugby World Cup in France but his injury curse would strike again. He was called into the starting line up for the final pool match against Tonga, where he was lauded for England's much improved competition at the breakdown. Moody kept his place in the starting line up for the quarter-final against Australia - earning his 50th cap - and again started the semi-final and final. He ruptured an achilles tendon in the first match of the 2008 Six Nations against Wales and was subsequently sidelined for almost nine months following ankle and then hip surgery that also ruled him out of the autumn internationals. After battling back to fitness and retaining his place in Martin Johnson's England Elite Squad he suffered a fresh blow on the eve of the 2009 Six Nations when he broke his ankle during training with Leicester. The injury forced Moody to reconsider his future in the sport but he fought back to take his place in the side for the 2009 November internationals and also reclaimed a starting berth for the 2010 Six Nations. In March 2010, he announced that he would be switching from Leicester to Premiership rivals Bath the following season - bringing an end to a 16-year relationship with the Tigers. And when injury ruled Steve Borthwick out of the team's final Six Nations clash against France, Moody was handed the captaincy for the first time. He retained the captaincy for the summer tour to Australia and New Zealand and steered his side to an historic victory over the Wallabies in Sydney. An eye injury threatened to rob him of the England captaincy ahead of the 2010 autumn internationals but he battled back to fitness to lead England against the All Blacks in their opening end of year clash. England improved further during the autumn, beating Australia, but Moody suffered a further setback at the turn of 2011 as he was ruled out for six weeks with knee ligament damage. Moody ultimately missed all of England's triumphant Six Nations campaign with the injury. He returned for Bath prior to the end of the season and was selected in England's preliminary World Cup squad. His return to the international fold came as captain against Wales in England's opening warm-up game for the World Cup, but further injury to his right knee ended his match prematurely and prompted fears of missing out on the World Cup. He was subsequently retained in the squad but was not fit enough for the opener with Argentina. However, he returned for the game against Georgia and started every game thereafter before England's involvement in the tournament was brought to an end by France in the quarter-finals. Moody then announced his retirement from international rugby on the eve of the final. Shortly after his return to England, he released his autobiography, in which he expressed his disappointment at the behaviour of some of his international colleagues during their time together in New Zealand. However, Moody's leadership and integrity were called into question by Rob Andrew in secret RFU documents which were leaked the media. The player was forced to issue a statement denying that he had put commercial gain before his rugby. Moody returned to the Bath side against Worcester on November 25, 2011, but sustained a shoulder injury. And it was that shoulder injury which put paid to his rugby career with Moody deciding to hang up his boots on March 6,2012 to bring the curtain down on an illustrious career.